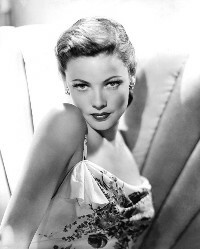 Brooklyn born Gene Eliza Tierney would survive several major tragedies in her life during a reign of stardom as a glamorous and talented Hollywood actress. Her role in the film version of the best-selling book "Leave Her to Heaven" earned her an Academy Award nomination for Best Actress. However, her most defining performance that made her a major star was in the Otto Preminger murder mystery movie "Laura." She had much success throughout the 1940's and 1950's..."The Razor's Edge" "The Ghost and Mrs. Muir" and "The Left Hand of God." Subsequently, weary of Hollywood and some thirty movie credits, she retired permanently from films. During her post Hollywood life, she made a few television appearance during her life in Houston which was mainly spent in extensive travel with her second husband and a major participant in civic and charitable causes. Her final career performance was in the TV miniseries "Scruples in 1980. Gene's father was Howard Sherwood Tierney an insurance broker and her mother Belle a former New England socialite and ex-school teacher. The family would number three with her the middle child. Privilege, a lavish childhood and finally very good looks would pave the way for an easy entry into the world of show business. Her parents first set her on a course for the life of a New England debutante with enrollment at a string of finishing schools from St. Margaret School in Waterbury, Connecticut to Unquowa School in Bridgeport and then the ultimate, Brillantmont in Lausanne, Switzerland. Upon returning home she completed her education at Farmington School culminating in a coming out party as a debutante. By 1939, Tierney began performing on Broadway after signing a contract with Columbia Pictures but the studio failed to find her work. She also was instrumental in gaining national recognition and exposure working as a model while her image appeared in Life, Harper's Bazaar and Collier's Weekly. http://www.viximus.com/_Viximus/Photos/Raw/BFB1DAE0-DBBE-480F-B682-37970EB5C945.jpg Tierney's autobiography, Self-Portrait, in which she candidly discussed her life, career and mental illness, was published in 1979.